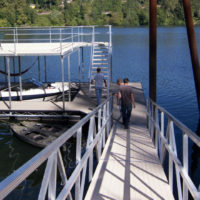 Gangways feature heavy-duty 2”x5” aluminum rectangle tube style and are available in lengths up to 48’. Welded construction forms a solid one-piece design. Gangways are standard with Truss railing, kickrail, midrail, pair of rollers, and heavy-duty transition plate with replaceable wear guard.